Judge urged to toss ruling that denied sage grouse protection. By Todd Dvorak. AP writer. The oil and gas industry, Farm Bureau, and assorted developers seem to feel immensely threatened by efforts to conserve the sage grouse and with it the remainders of the former “sagebrush sea” of the West. Bush’s ex-surgeon general tells House panel he was muzzled. SF Chronicle. This has nothing to do with wildlife, but is another example that the political muzzling, deliberate ignorance of science, etc. in the Bush Administration does not apply only to wildlife and closely related policies. The maps show the largest core (continuous sagebrush cover) habitats remaining in Wyoming and the Owyhee country of northern Nevada, Idaho, and eastern Oregon. A lot of the Nevada core habitat in Elko burned up last year. Now this year the Tongue fire is already burning in the Idaho portion of the ever-shrinking “core” habitat. And how much as the Oil and Gas industry destruction INCREASED in Wyoming? At the Sage Grouse Listing hearing in Boise, there was a battery of Attorneys: One from the Justice Department representing Fish and Wildlife and its abandonment of science, an “Industry” attorney, and attorneys representing both states of Idaho and Wyoming. The Wyoming fellow spoke of the “new conservation paradigm” that was supposed to be saving sage grouse. How absurd – especially coming from a person from the Oil Rig and CBM land of Wyoming. Give it a chance. Merle Lefkoff is working with biologists and the people at the grassroots level on this. She has had success with projects like this around the world. Don’t hold your breath on failure here. If you would ever once admit that sometimes the land and it’s creatures can be better off wth people, especially ranchers, on it, I’d figure you for more than just a hack for the “peopleless land cult”, devoid of all real care, observation or science, as long as the cult is honored then nothing else, including nature matters. I no many who know more than you do. They are on the land helping to bring it to abundance. Your comments on cheatgrass invasions being caused by cattle some way or another is not true. You are practicising a cultish mumbo-jumbo. Zion National Park is cheatgrass central no cattle. You should practice fenceline surveys to analyse what you can actually see. Much of the areas that have become peopleless are greatly deteriorated. Ancient herdland, live soils ecologies going progressive senescent. The Migratory Herdland ecological pathway is resilient and life-giving. Well-managed herdlands are quickly becoming the norm, the moderate grazing predominating in the SW today is easily surpassing long term rested areas in broad-scale ecological abundance. The decades long landscape-scale experiments called National Parks ripe for diagnosis, examples of the European assumption that non-disturbance is natural as a policy for protection of western lands. People have honestly believed this. Are you willing to take an honest look at how your “beliefs” affect the lives of the wild organisms that live in National Parks in lower-elevation precipitation zones and climates that are not like Europe? The average grass plant is dead. The native bunchgrasses are almost gone. The most common grass is non-native cheatgrass. Native grass seedlings are very rare, typically less than 3% in a good year. Animals, birds, and insects that cannot adapt to these conditions are gone. The Buenos Aires National Wildlife Refuge was over-grazed, then the grasslands were restored by a rancher before being bought by USFWS in 1985. Since that time the Buenos Aires has been ungrazed by livestock. An aggressive prescribed fire program has been implimented to protect the area from mesquite encroachment. Much of the land looks like it’s been graze-burnt, as if its been severely overgrazed, remember it was a functional and abundant grassland when the cattle were removed. The masked bobwhite has not thrived Though some 2,000 captive-bred birds are released annually the yearly censuses typically indicate about 300-500 out of tens of thousands released. *The average native perennial grass and flowering plants here are thriving: the native bunchgrasses and the prostrate native garss species are dark in color and strong stemmed. * There are many native flowers; plants are inches or fractions of inches apart. * Seedlings outnumber old plants several times, establishing in amounts exceeding death rate. 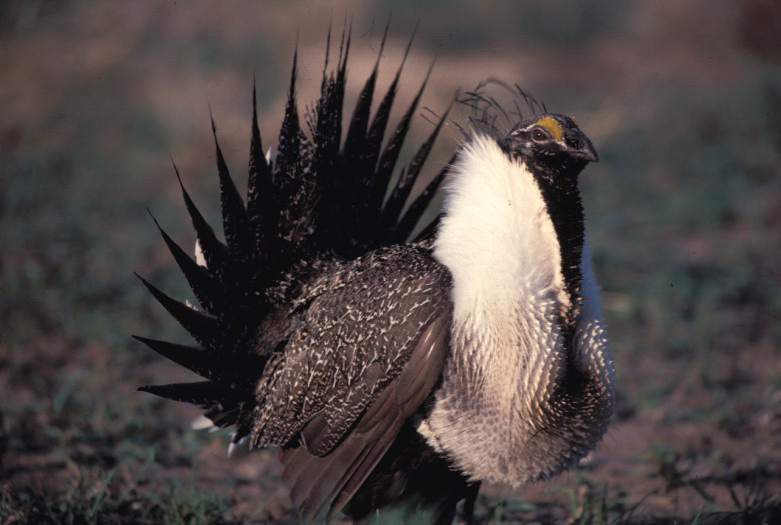 Why do public lands users fear Endangered Species Act listing for greater sage-grouse? If graziers, oil and gas developers, off-road vehicle riders, utility companies and others are already doing all that is necessary to recover sage-grouse (as they claim), what do they have to fear from listing? They have every opportunity to demonstrate that their activities don’t harm sage-grouse and that grouse populations are increasing in despite their use of public lands. On the other hand, if sage-grouse continue to decline due to habitat loss and degradation, then Endangered Species Act protection will serve as a safety net for the species by restricting harmful activities in sage-grouse range and ensuring that the burden of conserving sage-grouse falls equally on all stakeholders. The website Mark refers to http://www.sagebrushsea.org/. Webmaster. Mary, I’m afraid that you’re the one “practicising a cultish mumbo-jumbo” and even more afraid that uninformed people will read your stuff and give it credibility out of ignorance. Sure, kt may be a bit of a purist on occasion; but, she’s on very solid ground when she links oil and gas development to problems in sage grouse country. The truth is that it is your stuff, not hers, that consistently leans more toward cult nonsense. “The Migratory Herdland ecological pathway is resilient and life-giving.” Are you still on that kick? One minute you quote that garbage and the next you’re criticizing people for not understanding that their environments “are not like Europe.” So, how exactly does your use of European livestock with an African grazing model on North American range come closer to fitting the picture? You just bounce from one wall to another and, under the circumstances, those walls ought to at least be padded and the door locked. I’m sorry; but, the sad thing is that you and your poorly educated, but fairly inbred, friends don’t even have the capability to comprehend how ridiculously mixed up you are. Mary…You mentioned research done by Merle Lefkoff. I can’t seem to find any info on the work she is doing or has done. Please let me know where I can locate some of her work. Thankyou. Jerry, From her biop Merle seems to be working as a facilitator, using the knowledge of biologists and those who live on the ground to effect ecological restorations with the help of the traditional cultures on the land, the results are awesome and dwarf all “no use” areas for ecological values. Sorry Mickarooni, your logic and lack of information don’t hold water. The people working on this project are the historic often indigenous cultures. The grass, watershed, and land does not care which ungulate it comes from as long as , like cattle, it has hooves to make indentations to catch seeds and water, and the urine and manure to fertilize and innoculate the soil. The grass doesn’t care who eats it, but will become senescent if it isn’t. The legal definition of inigenious ias at least three generatons on the land. Many “European” families here qualify. The endangered species act is being used as a tool for process here (of rural cleansing) here not results. The NGOs and Agencies have for the most part abandoned nature for this process. There fore it does not phase them at all when they finally admit that the (haha) Northern Spotted owl didn’t really nest in old growth afterall. Now in Oregon these conservation biologists themselves are going to kill off masses of barred owls with shotguns because they “say” they are killing the spotted owls even though there is known case of a barred owl out competing or killing a spotted owl, though many instances of them being killed by hawks etc. Your guess is as good as mine. It’s somewhere on the sosforests website, where Mike has a GREAT biblography of Forest history of North America. Did you know that all “old growth” forests are anthropogenic? The really magnificient forests never exist without mans stewardship. The ranchers here are WHAT’S HAPPENING in species recovery here, outside the wolf, which is not being managed to either the wolves or the peoples benefit. No use areas are fast becoming lands of little natural culture, stripped of the most effective abundance booster of so many centuries on the land, man in the form of good steward. Note I added the boldface in Mary’s quote to call attention to it, so people can see how it relates to my follow-up. She did not put it in boldface. Webmaster. The notion that the Endangered Species Act is a tool for “rural cleansing” is both a dangerous and outrageous comment. It is outrageous because it assumes people who don’t want to see most of our native species disappear really have another agenda — one of genocide of rural people. It is dangerous because if someone thinks a group of people are out to kill them off, they will act to defend themselves. If I really thought some person or group was out to kill me, I might well act first. I think you ought to consider comments such as “rural cleansing” much more carefully. I’ve never been to your “neck of the woods,” and there are two reasons – the perception that it is plenty dangerous for outsiders to visit there, and the danger is not from wolves. 2. I have heard that it is an overgrazed, eroding mess. No wonder Catron County and some others with this viewpoint have such an awful reputation among many of those who follow Western politics and culture. Mary, I think I hear the black helicopters coming…get to hidin’ in the cellar quick!! Ralph, I have been there, a lot, and 1) it certainly can be “plenty dangerous for outsiders” and, no, “the danger is not from wolves” and 2) it sure is “an overgrazed, eroding mess” in so many areas. Much of the problem is a result of the long history of primitive superstition, poor education, and childlike emotionalism in those rural people and it continues today. It truly is a western version of Appalachia, only the real Appalachia has thankfully evolved past those old stereotypes. It also doesn’t help when groups like the Quivira Coalition, eager to gain followers, stoop to sugar-coated pablum, half-truths, and fairy-tale pandering to their target audience. Just look at the stilted, skewed, and loaded language that is encouraged. “…dedicated to healthy natural environments and rural cultures, and to the idea of creating a synergistic, life-blessed interface between these and urban civilization.” It’s part pseudo-science and part Elmer Gantry, not to mention preaching that the European settlers in the area are really indigenous, which smacks of the NAZI technique of preaching superiority based on whatever perverted interpretation they could get the Germans to believe. It’s probably good to get some Catron County folks on the blog, so people can see what they believe. I would rather live deep in the wilderness with bears, cougers, and wolves. I know what to expect from the animals…..
Come on you guts, you’re behaving like a buncha blind yesmen for your agenda. Rational after rational you come up with does not relate to the reality here. What I’m saying about the ecological benefits of human use and cattle on the land is not untruth. People who have open minds and investigate will find this truth in scientific papers put out by the feds own scientists Dr John Rinne, world reknowned ecologist and foremost fisheries research biologist in the SW has stated that he is personnally aware that forced removal (thanks to the Center for Biological Diversity) of cattle access to the rivers in AZ has led to the extinction of endangered cyprinids (minnows, dace, chubs suckers) on vast reaches of AZ rivers. the year they took the cattle of. Native fish here like thrive with the disturbance of cattle, at river crossings, where streams pass through corrals (J. Rinne). No the Center for biological destruction wants to repeat the slaughter of native fish in NM. I am not spouting the “scientific” yes man blather the corrupt “scientific” yes men often quoted by the Center For Biological Destruction who have testified in court making such astute observations such as “Cows eat fish” and “cows step on the redds (nests)” of fish that don’t even lay eggs. Its public record. As a REAL reasearch scientist of integrity, without ties to funding by such thigs as quote-unquote “saving” fish etc. His papers are published in scientific journals, just like the sellout peopleless landscape agendists who are destroying nature here. You see, if depart from reality for your measure in order to serve an agenda rather than nature, you actions become destructive to nature, just like Maxam’s liquidation of the vast private forests in Northern California back in the ’70s. Lust for result over perception gives one a black thumb when it comes nature, developing policies not to save nature, but to satisfy a bias such as “all ranching should be removed from the west” Even if it destroys all the endangered cyprinids in Az and NM? YEP! Even if it destroys the last generational and sustainable cultures in AZ and NM who have achieved a high and bountiful level of stewardship of THEIR land, which will go to developers as the gradualism of the rural cleansing/cultural genocide progresses? Hey I GET IT! Its ok for you’all to commit cultural genocide, but its some sort of crime if I call you on it. I’m not scared of you and I’m definately not going for your jive. And there’s nothing scary or outre about stating the obvious. The Re-wilding Institute wants our land and they will and are committing these crimes against nature and humanity to get it. They BRAG about how they’re now writing the script for the Government agencies obviously now enthralled to their agenda. Have you ever noticed how the plan to return 50% of the land to something its never been before and they don’t ever mention exactly how they’re going to accomplish this rural cleansing (of people who work and fight hard against massive odds to STAY ON THE LAND) that is their stated goal “peopleless landscape”. The whole ecology of the earth has changed for good since man became a part of the picture. I guess those in the cities better move over. And the people in Albuquerque and Phoenix thought the mexican population was unbearable. If I call it a rural exodus, is that a more acceptable term than the genocide being caused by constant harrassment (OF “to set dogs upon) and removal of use of our properties. Even the World Bank recognizes in a new policy statement that removal of use is the same as displacement and needs to be compensated. You think those that are working hard to drive people off the land here will recognize the morality of that? Fat chance. These people are rapidly entering a state of sub-human and degenerating in my book. Wake up or join the crowd down there with the scum of sub-human faschist mentality. Thanks for the interesting post. The first part was informative and worthy of debate, but you lost me near the end. And don’t even talk about “scum of sub-human faschist (sic) mentality”. The green men (a.k.a. United Nations biodiversity security forces) are probably watching you. And if they can overturn the Supreme Court (formerly the 3rd branch of the US Govt, now a quasi-independent corporation run by the executive branch) they WILL confisicate your house unless you put on some solar panels or add a whole ton of insulation to your attic. And you think they’re gonna compensate you for it? NO WAY. They will probably move you into a wolf’s den, or maybe make you live in a fricken BIRD’S NEST. I read all about it in RANGE magazine a couple of months ago. Very Informative. Really. But, hey, sorry I diverged a little there. While thinking about what you wrote, one question in particular came to mind: How did the fish in Arizona manage to survive prior to the arrival of cows? I have found no science on how the cyprinids survived without cattle but have wondered about that. My guess is that they were here before cattle but never thrived as they did over such a large territory till cattle provided the, “warm shallow braided refugia” (J. Rinne) in more abundance at their watering sights. The dynamics of the death of the native fish on the Verde is interesting. When cattle were removed (thanks to the Center for Bioillogical Destruction) the river changed dramatically as plant growth quickly began to solidly “hedge in” the shoreline. This caused the river to run ever narrower, deeper and colder forming perfect habit for the exotic eastern species such as Bass who moved in and thrived in their posh new digs. The cattleless rivers are for the most part experiencing much more erosion than they did before, channeling ever deeper as silt builds up in the thick hedges and the force of faster more deeply channeled water digs ever deeper. Kind of an arroyo effect with often very thick willow and cottonwood hedges, sometimes 40+ feet either side. Not really trout habitat. On the Blue River the effect is the same but this smaller river looks to be drying up from the huge amount of thick growth hemming it in. At night when the willows and cottonwoods stop sucking the water that evaporates from their leaves the river comes up again. I give it another 5-10 years of life judging by the rate its disappearing and the size the cottonwoods are achieving and the ever greater width and mass of the willow thicket. I guess I’m safe. I do have solar panels. Designed my system myself (480 watts of panels) and a new 40 year, (remote telecommunications) battery. It’s been working beautifully for 10+ years, lots of insulation above – R46 in the ceiling, and strawbale walls. I really live really, really green, grow my own fruit and vegetables and herbs, and save the seeds each year. Contrary to the blather by some on this site, I am not stupid and like my neighbors have a keen thirst for exploration and knowledge. It’s really interesting to go to meetings with people who must constantly be in a state of discovery and adaptability and change survive and thrive in nature here and the so-called “environmentalists” that flock in to insert their presence and agendas into our lives. The people here are always interesting, and at meetings everyone has a different perspective or insight to add to the considerations at hand. The so-called “environmentalists” on the other hand have what you see so much in evidence on this sight. A kind of lockstep mentality that repeats the same tired dogmas over and over again. At the meetings you’ll get a couple of facinating insights by the locals and the (here it comes again) a word for word repetition of what the last 6 “enviros”. Exact numbers, words, etc. I really don’t think they think. Its like someone inserted a tape and that’s all that’s there. GREAT fascist agenda fodder! Scary when you logically follow the implications though.